The other day, I was looking at the overload of tomatoes that I bought as the season was winding down as the end of summer nears. But I realized that I was being gradually shoved out of my small kitchen by them, so I oven-roasted the louts with garlic and herbs to reclaim a few precious inches back of kitchen counter space. Yet when they were finished, I looked in my refrigerator, and there wasn’t any room in there either. So I was left holding a bowl of roasted tomatoes that needed to get used up. I’ve oven-roasted plenty of tomatoes in my lifetime, especially when I need to pull and extract as much flavor as I can from less-than-exemplary specimens. The simple technique works well for coaxing out flavors from even those completely vapid on-the-vine greenhouse tomatoes that look promising, but the only thing they add to your cooking is color. And, of course, you can save the concentrated tomatoes in the freezer – if you have space – and use them all winter long. 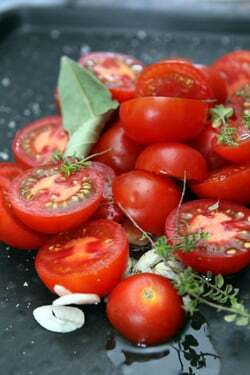 Basically, you just take some tomatoes, toss them in a splash of olive oil, some herbs, and sliced up garlic. I gave up mincing garlic years ago since I like getting more noticeable bits of garlic when eating, and I can’t imagine anyone not liking pizza with larger chunks of roasted garlic as well. The baking time for the tomatoes will vary, depending on the tomatoes you use. Just cook them until they give up most of their juices, which softens them nicely and concentrates their flavor. I used small tomatoes, around the size of a ping-pong ball, but you can use cherry tomatoes (cooking them less) or Roma tomatoes, depending on where you live, and the season. I have a crummy apartment oven and you can get pretty good results in whatever oven you have, if you know how to use it and which parts are the hottest. Generally speaking, the lower part of the oven is the hottest and makes the crispiest crust, but fancier ovens have elements on top. Still, I think closer to the bottom works well in those ovens, too. Of course, having a pizza stone really helps (and I am coveting this cast-iron pizza pan). But in the meantime, when one has to decide whether to use your valuable space for shoes or a pizza stone, well, I’m not ready suffer blisters on my feet in the name of picture-perfect pizza. I use a baking sheet, which I preheat on the bottom of the oven, then assemble the pizza on a sheet of parchment paper and slide it onto the hot baking sheet. 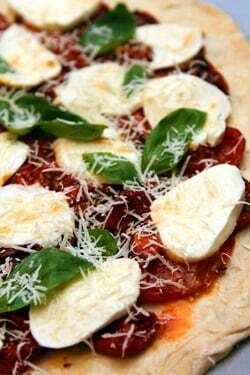 Pizza dough is really easy to make and I’ve linked to a few recipes below. You can also find fresh (unrolled) pizza dough sometimes sold in well-stocked markets. On tip on rolling out yeasted doughs; they can be really wily once you start rolling and stretching them out, and can start fighting back when working with them. If you roll them out partially, then let them sit for a couple of minutes, they’ll relax enough to be ready to roll some more. I’m a big fan of pieces of roasted garlic on my pizza. 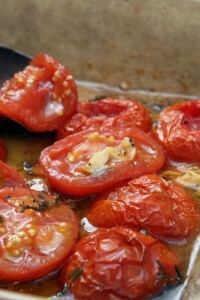 But depending how juicy your tomatoes are, you want to make sure the garlic gets cooked and softened, but not charred. I often slice the garlic when using smaller tomatoes, because they cook much more quickly. With larger tomatoes, you might want to quarter the garlic lengthwise of even just slice them in half, depending on the size of the garlic. 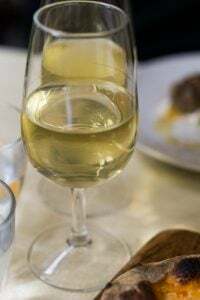 In any case, if the pieces of garlic seem to be getting too dark, either pluck them out or tuck the pieces under some of the tomatoes that are cut-side down so they don’t burn.There are various kinds of mozzarella with various moisture contents. 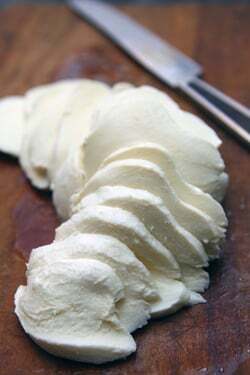 I used fresh mozzarella, as shown, which you should blot dry before using. Depending on what cheese you use, if you’re concerned about excessive moisture, feel free to use less. 1. Preheat the oven to 350ºF (180ºC). 3. Roast in the oven for 1 hour, checking midway during roasting to make sure the garlic isn’t burning. If the tomatoes are getting overly dark on the bottom, turn them gently with a spatula. 4. After one hour, turn off oven and leave tomatoes in the oven until oven cools completely. 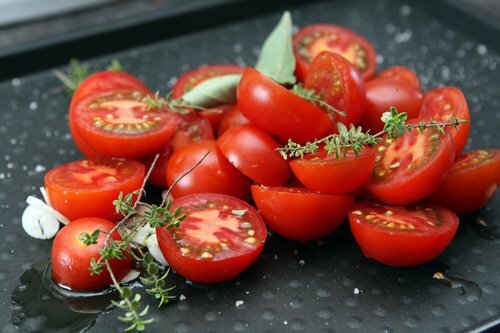 Roasting time will vary depending on the size of tomatoes; just roast them until they’ve given up their juices, as shown in the picture in the post. 5. To make the pizza, preheat the oven to 450ºF (235ºC) and place a heavy baking sheet on rack on the lower third of the oven. 6. 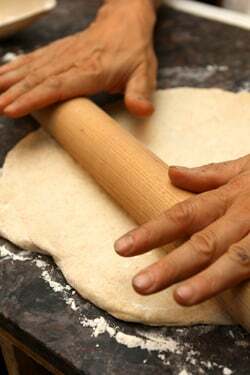 On a lightly floured surface, roll and stretch the pizza dough into a 14-inch (36 cm) circle. Place the dough on a sheet of parchment paper. 7. Brush the dough with a thin layer of olive oil. Drain the tomatoes well (reserve the liquid for a vinaigrette or soup), then distribute the tomatoes and garlic over the dough. 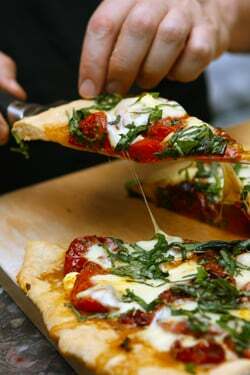 Put the mozzarella slices over the tomatoes, then place a dozen fresh basil leaves on top of the pizza and grate some Parmesan over the top. 8. Transfer the pizza to the baking sheet by grabbing the hot baking sheet out of the oven (wearing an oven mitt to avoid burning yourself) and slide the pizza onto the hot baking sheet. 9. Return the pizza to the oven and bake for 10 to 20 minutes (see Note), until the pizza is baked to your liking; the bottom crust should be crisp and the top should be slightly browned and bubbling. 10. Remove from the oven and strew chopped fresh basil over the top along with a generous sprinkling of additional grated Parmesan cheese. Variations: You can use a different cheese if you wish. 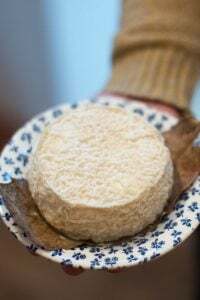 Fresh goat cheese, smoked mozzarella, or a semi-soft cheese like Fontina work well on pizza. You could also add bits of bacon or prosciutto to the pizza. —I most unfortuntaly live with the only person on the planet who does not like roasted garlic. I just cook as much as I want, and shut my trap when I see a six-ack of red coke cans going into the fridge. compromise, compromise. Beautiful pizza and photos by the way. Makes me want to eat pizza for breakfast! A tip I took from Lottie + Doof: a little maple syrup makes sad, winter tomatoes improve a lot when roasted. Useless, now that it is summer. I still remember one of the funniest discussions I had on a train, while I was living in Northern Italy. I was eating a sandwich with some oven roasted tomatoes, delicious, and I was describing the lengthy procedure to make them to my friend. Sitting next to us there were two guys from Sicily who just looked at me amazed and asked why on Earth I did not just let them out in the sun like their mothers and grandmothers did… I still dream some day I’ll be able to dry my tomatoes in the sun. Oh my! This pizza with roasted tomatoes is so appealing. 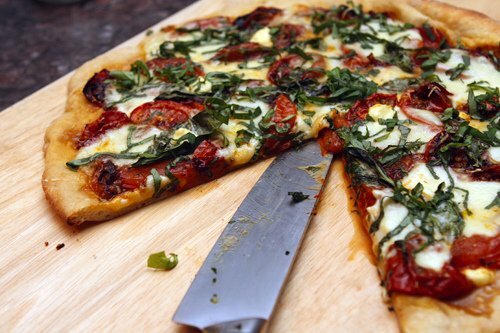 You see, I roast tomatoes when these is to much of these in my backyard… I’ll definitly try this pizza! OH GOSH! this pizza is great!!!! Lovely pizza but PLEASE tell me you weren’t considering putting tomatoes in the refrigerator???!!! This is really fantastic! 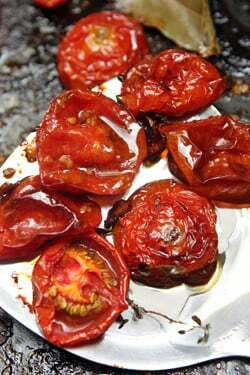 I love, LOVE the idea of using roasted tomatoes as your base. I made a decent enough sauce with mine and a whole wheat pizza crust that was surprisingly good, but…WOW. It’s roasted tomatoes next time! NewNomad: I put the roasted tomatoes in the refrigerator if I’m not going to use them within a few hours or so. But I don’t chill fresh tomatoes and don’t recommend it. Great post. End of your tomato season?? I’m in central France at the base of the Loire Valley and my vines are weighed down with fruit — tout vert! — and only just starting to redden. I haven’t picked a single fruit yet. It’s been incredibly late for some reason in my garden despite planting in mid-May when, back in New York, I had to wait until mid-June safely. I often “sun dry” my tomatoes in the oven, notwithstanding the price of electric here, but hadn’t stopped to consider roasting and then freezing my harvest. Thanks for a great idea. I bet I can roast the tomatoes and then can them so I don’t have to put them in the freezer. Why did I never think of this? On that note, end of season, I often puree my huge clumps of basil and either put them with a dash of oil into ice cube trays or make a very dense, low-oil pesto and, again, store in ice cube trays ’til frozen before popping into Ziploc bags. Then, when I want pesto, I just defrost a cube or two and add oil. Yum! In one of the deleted comments, Kathy asked about keeping a pizza stone in the oven, and would it work. My answer was also deleted. So to Kathy, I have done this for over a decade and never had a problem. And yes to all your suppositions: you can put just about anything on top of it to bake, and it will hold the heat and keep things warm afterward, and it’s a terrific storage method. The kitchen store recommended this method of storing; otherwise I too wouldn’t have had convenient storage space for such a heavy item. David, is it still pizza marguerita if the tomatoes are French?!! Let’s see – I know I commented, but I also remember being very, very tired and sleepy. Oh, and I was questioning the amount of mozzarella… 8oz is about two balls, right? That seems a little excessive for a single pizza. Did your pizza not turn out soggy? Also, I’m surprised about the char you were able to get in a home oven. Did you turn on the broiler? FANTASTIC!! 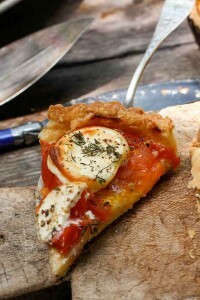 I want that pan and I am overloaded with tomatos from the CSA so this perfect! Instead of a pizza stone, you can use the bottom of a cast iron pan, just flip it over. This slightly limits the size of your pizza, but saves a lot of space! My daughter brought a pizza over last night and we were wondering between us when the last time was that we had a pizza with red sauce and pepperoni. 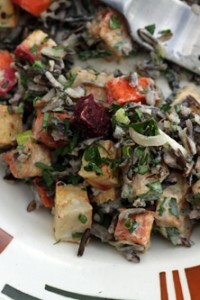 This is so up my alley…simple, fresh, great ingredients. Looks beautiful too…you are a magician with that oven sir! I hope you ate that for breakfast . . . looks decadent . . . I wouldn’t change a thing. Never tried roasting fresh tomatoes though, always just made lots of tomato sauce and froze it for use throughout the winter. Think I’ll make some of what you did this weekend to go with some crusty bread topped with feta cheese & Greek oregano or fresh baby basil. Hello and thank-you for the cast iron pizza pan link! ….I also would like to try your method of building the pie on parchment: but it was unclear to me if the parchment goes into the stove with the pizza or if the “sliding in” means getting it free of it? This is one of my favorite pizzas,classy,delicious and easy to make. 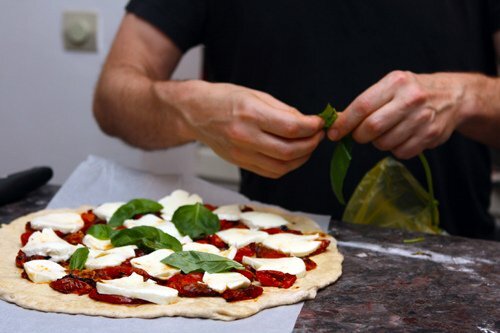 Your pizza looks divine – I love roasted tomatoes and, although I usually use a more simple tomato sauce on pizza, I’m going to give this a go. Soft, caramelized roasted garlic also sounds amazing. I was always told to tear basil rather than chopping it as it releases more flavour and doesn’t bruise it so much – is that just a myth? Mac: Yes, it stays on the parchment paper, which I just slide onto the hot baking sheet carefully. Being a lazy woman, I’m taste testing Safeway vs. Trader Joe’s dough this week. And I’ve been converted to use my grill with a pizza pan (the stone keeps breaking due to the heat) instead of using the oven. Love the smoked results. Thanks for that post, David. This past weekend I just picked some ripe tomatoes from my garden and made some sauce for freezing…still have a lot of green tomatoes here in San Diego…not that hot of a summer. 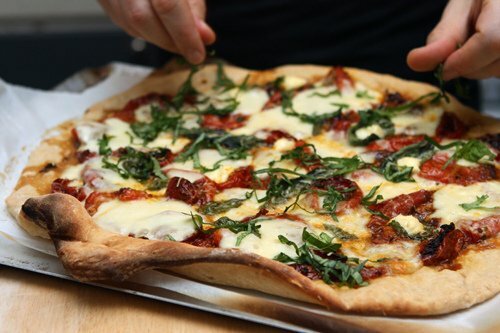 The pizza looks absolutely drool-worthy; I’ll have to try this recipe later this week! Your small kitchen rewards those of us without a million gadgets with practical suggestions. Have a great time in Berkeley. I will be at the event on Friday night at the Museum. Someone bought me that pizza pan as a gift. Buy it…it is great. I also have this one http://tinyurl.com/3d39sjz that I prefer one using cornmeal under the crust. Pizza looks awesome. My wife and I make this one that we love, pulled chicken and roasted zucchini, summer squash and onion. Tres bon. Well that does it. David, I am completely smitten with your tomato photos. Now I’m trying to figure out a way to sneak out, run home, and pull a ball of pizza dough out to thaw. I too have a crummy oven and no pizza stone, but I find an overturned baking tray does the trick. I use it for baking bread too, and I’ve been pretty happy with the results. I’m so deeply enamored of roasted tomatoes these days, I dunno if I can ever go back to fresh… this pizza looks perfect! Love the idea of roasting the tomatoes and garlic before hand. For those of you making your own dough, sprinkle a little basil and oregano in with the flour if you enjoy a nice, herbed crust. My favorite pizza is pretty simple: an herbed crust topped with roasted red pepper sauce, smoked duck breast, raw red onions and fresh mozzarella. Crepe pan is good for making pizza too and if you have this,http://www.staub.fr/en/articledetails.html?category=402&type=Pancake+pan, its nicely flat and goes without trouble on same drawer with other ovenpans and trays. Bryan: Pizza stones are pretty great. A while back someone came out with a ‘Hearth Kit’ that is like a pizza stone, but has sides as well. They sent me one to try and it was back in California but my oven was too small to use it in. P.S. My sisters and I enjoy your blog so much! We’re faithful readers. I have a 14.5″ x 16.5″ pizza stone (bought in the US) in my IKEA wall oven bought at the IKEA in St. Étienne (and before it was in my Arthur Martin oven). The oven shelves are slightly wider than 17″, so it is a perfect fit. I also have one in my oven in the US, and have always left them permanently in the oven, with good results. In the US, you can order it on Amazon …but I think I bought mine at Bed, Bath & Beyond, or another of those stores. Also, Emile Henry makes one, but it’s too wide. Amazing looking pizza! Love the idea of the parchment for those of us who do not have room for a pizza peel. I have been using a plate to prep my pizza, and the result is sometimes not pretty, but parchment would work much better. Love the idea of putting roasted tomatoes on pizza. Might I suggest, however, a technique for assuring that the crust does not get soggy in the center and that is to bake the round of pizza dough 4 minutes, take it out, put the toppings on and then put it back in the oven. The crust is then crisp throughout. Also, I would be more generous with the cheese. It shouldn’t appear in patches, but bubbling up over the whole pizza (my preference). By the way, even if you had a pizza stone, you don’t really need a peel. A rimless baking sheetsubstitutes perfectly. You are a foodie, connoisseur of good food, chef, and you have a crummy apartment oven, not enough counter space, not enough refrigerator space……Why? You deserve better! Go for it! This is a beautiful meal. I’ve been roasting romas for a week now and still the kitchen counter has no clear space. It might have something to do with the fact that all the white peaches decided to ripen at once also. It’s a nice problem. That pizza looks wonderful! Now I regret giving away my mini pizza stones (“individual” size). I had them for years but never used them and they were taking up valuable real estate in my small kitchen. I noticed Williams-Sonoma still sells the mini size. I too have a smaller size oven. 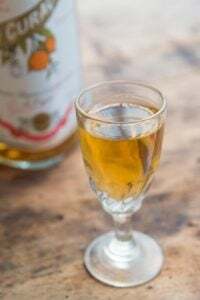 I may have to splurge just to try this recipe! I wish we had incredible tomatoes like those found in europe. I can honestly say I’ve never seen any look like the ones in your photo. I remember traveling through Italy – the tomatoes were outstanding. Then I came home and they were so boring. Can you tell me, when you roast your tomatoes, how do you feel is the best way to freeze them? Your pizza by the way, looks wonderful! This sounds just about perfect right now! I can’t wait for the gorgeous summer tomatoes here in Sydney. Then I can make this pizza too. After finally buying our first home this past winter, we now have room for a deep freezer. I’ve already slow roasted 3 batches of romas from the garden so I can make pizzas like this all winter long. They are so delicious! Yum, a glut of tomatoes in the market at the moment….this looks just the ticket of what to do with them….you can make a great soup with roasted tomatoes and peppers, very simple and very delicious and both readily available at the moment. I just bought what has to be the nastiest bunch of tomatoes at the market today and your roasting idea just might redeem them. UNfortunately we’re on the 8th day of an insane late summer heat wave here in Italy. In the meantime I’ll file your advice away for when I can use my oven again. Thanks! Thanks for the tip about blotting the fresh mozzarella. I had been disappointed with some soggy pizzas, and was thinking I would need to switch to regular mozzarella. I’ll try blotting and see how it goes! 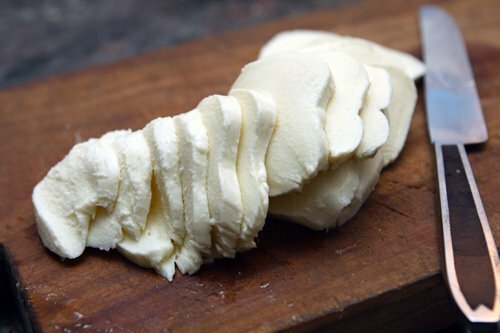 There’s so many different kinds of mozzarella and if yours is very moist or wet, it’s a good idea to wick away any moisture first. All i want to eat is pizza now! Tomatoes are amazing this time of year. I used some in a basil tomato tart recently and the tomatoes tasted fantastic. Now I’ve got to get my hands on some good mozzarella and I’m getting myself some pizza! Can’t wait! David: I have a cast iron griddle that I use to cook my pizza (I think it’s a 12″, so it’s smaller than the pizza pan you lust after) I love, love, love it for cooking pizza . . . I use it for a lot of things (it’s great for cooking homemade tortillas) and it is the best way to heat up left over pizza . . . I greatly dislike pizza heated in the microwave, and putting it on the griddle with a lid and heating it on top of the stove makes the pizza taste like it just came out of the oven. We have had strange weather in northern California this year with unseasonal lows during the day and even cooler nights so our tomatoes are way behind schedule. But last year this weather allowed me to be harvesting tomatoes into late October, so I’m hoping for that again this year. Even my early girls are late this year — but my ping pong pinks are keeping me well supplied! Thank you for this great post. I know what I’ll have for dinner this evening! I hope to see you at Omnivore on the 30th! David – thanks for the tips on tomatoes. This pizza looks great!! I can’t wait to make it for my family. Tomatoes on something bready are obviously in the air. Just used up some of my Turkish-shop glut on puff pastry with goat’s cheese (Delia recipe) and now here;s another brilliant idea. Lovely, and as someone else just said this makes me want to eat pizza for breakfast…(which I swear I never have before). Love the piece on apps too btw. How do they say ‘app’ in French? ; it’s almost a natural ‘drop the h’ French word! Yikes, I got deleted! The Lodge pan is AMAZING (and I am lucky to have plenty of room for it) – especially for socca. This time, using your recipe, it came out as close to Pipo as I think we’ll ever get here. The cast iron pizza pan you covet is great! I love mine! Love your blog too. you’ve made me incredibly hungry for pizza at 7 in the morning. my day’s going to be restless till i get my hands on some! this looks delicious – the dough just perfect!!! I hate to do this but can you please, please tell how much (more or less) flour / instant yeast / water / salt / sugar / olive oil(?) I need to have the dough turn out like yours???? THANK YOU!!! thanks for the recipe. I recently moved to France and am having some issues with finding a flour I need. What sort of flour is preferable for pizza in French system? I know that in Italian it should be type 00 together with 01. You don’t need to choose between shoes and a pizza stone! My stone lives in the oven all the time, never leaves it, and helps provide an even and lasting heat by virtue of its thermal inertia. Would that work for you? 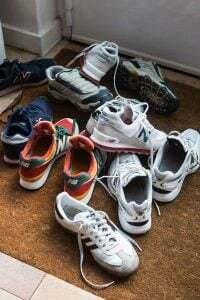 Unless, of course, you store your shoes in the oven already! 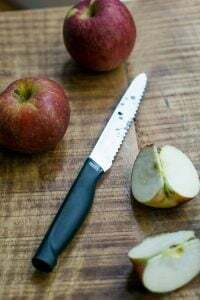 A few weeks ago I posted a recipe for a green tomato and apple chutney. 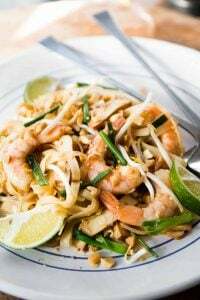 That’s a good way to use up green tomatoes and is a great condiment with roasted or grilled meats, and other dishes. The pizza looks so fresh and inviting. Good use of the crop of tomatoes. thank you David — wonderful pizza! I made it tonight for my family. The only change was to use caramelized onions instead of garlic since they won’t eat garlic. And I cooked it on the grill with a pizza stone. This will probably be my favorite pizza to make now…. I absolutely adore basil on pizza. This recipe looks wonderful to me. I think Margaret’s suggestionof carmelized onions is yummy, though I would not replace the garlic–I’d use both! Yum. Thanks for the recipe for roasting tomatoes! The cherry toms were taking over the garden and this was the perfect solution for our bumper crop. Not much left to freeze from the first double batch – the sweet/savory condensed tomatoes were addictive. We were trying to figure out how to bottle the amazing syrup left in the pan. I never would have thought to add the bay leaf but it added such a lovely note. I made this for my family and they said it was the best pizza ever! An excellent small-apartment alternative to a baking stone is four unglazed quarry tiles. These are usually sold at hardware stores for around 25 American cents. They are essentially untreated, unsurfaced shale or fired clay tiles that come in about 5″x5″ squares. You simply lay them out in your oven to make the necessary sized surface; throw your loaf or dough on top to get a better crust. When you are done and you’ve allowed them to cool, you can stack them and they are much simpler to store. I actually store mine on the corner of the upper shelf in the oven, even when baking other things. Just make sure you get tiles that can withstand >500 deg F.
In this blog post, I realize you are lamenting your lack of the proper kitchen gadgets, such as the pizza stone and the pizza peel, but I for one truly appreciate that your recipe demonstrates the successful cooking of a delicious pizza without such fancy accouterments, for I am certainly lacking these materials as well. 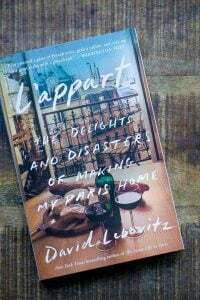 Please keep eating, cooking, and posting your recollections or your travels and your recipes, as they are always very colorful reads. I don’t know as I’ve not saved it for very long. But I would refrigerate it if keeping it longer than one day and probably use it within a week.